My Day: Click to display the My Day mini-application. Out of Office: For Exchange accounts only, click to display the Out of Office Assistant dialog. 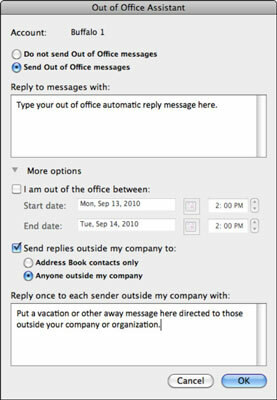 Set rules for handling internal and external out of office messages in this dialog. Public Folders: For Exchange accounts only, click to display a folder browser that lets you subscribe to public folders that you have been given permission to use. Import: Displays the Import dialog. Export: Displays the Export dialog, where you can choose to save your contacts in a tab-delimited .txt file, or save an Outlook archive (for backing up or moving to another computer) as an .olm file. Sync Services: You can choose to sync your Outlook contacts with Apple Address book and MobileMe. Schedules: Displays a pop-up menu, where you can choose Empty Deleted Items Folder, Send and Receive All, or Send All. Mailing Lists: Displays the Mailing List Manager, where advanced users can set rules to automatically move messages from one folder to another, and even run an AppleScript from Outlook. Progress: Displays a small dialog showing progress bars of any activity between Outlook and servers it’s exchanging information with. Errors: Displays a dialog describing errors Outlook encountered. This information may be useful in diagnosing connection and set up problems. Online/Offline mode: This button toggles Outlook to Offline mode, where it remembers your actions. You can work in Offline mode when you’re reading and replying to mail, checking or adding calendar events, and so on. When you’re connected to the Internet, you can switch back to Online mode, and Outlook synchronizes everything for you automatically.